The Emilio Sanchez Special Olympics Tennis Night Tennis Legends. Pros. Music. A special night. 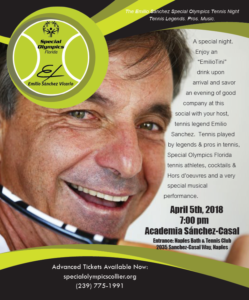 Enjoy an “EmilioTini” drink upon arrival and savor an evening of good company at this social with your host, tennis legend Emilio Sanchez. Tennis played by legends & pros in tennis, Special Olympics Florida tennis athletes, cocktails & Hors d’oeuvres and a very special musical performance. https://colliercountysports.com/wp-content/uploads/2018/02/Academia-Sanchez-Casal.png 870 722 Russell Tuff https://colliercountysports.com/wp-content/uploads/2017/11/small-logo.png Russell Tuff2018-02-15 11:08:282018-02-15 11:08:28The Emilio Sanchez Special Olympics Tennis Night Tennis Legends. Pros. Music.